In a blog from last month I wrote about the good work that’s already been done within individual biodiversity knowledge domains. But what are the future needs of scientists, ecological consultants, land managers, environmental agencies working across those domains? To enable significant and effective conservation and land management in a changing landscape, biodiversity data needs to be integrated and reliably shared on a massive scale. what species and ecological communities occur in this parcel of land and how complete and reliable are those data? how representative is our biodiversity knowledge in any location and across the State? where are all the long-term survey sites and what can they tell us about the changes in biodiversity and ecosystem health over time? what are the ecological constraints on any new land use proposals? what are the gaps in our knowledge and where are the skills and resources required to fill those gaps. 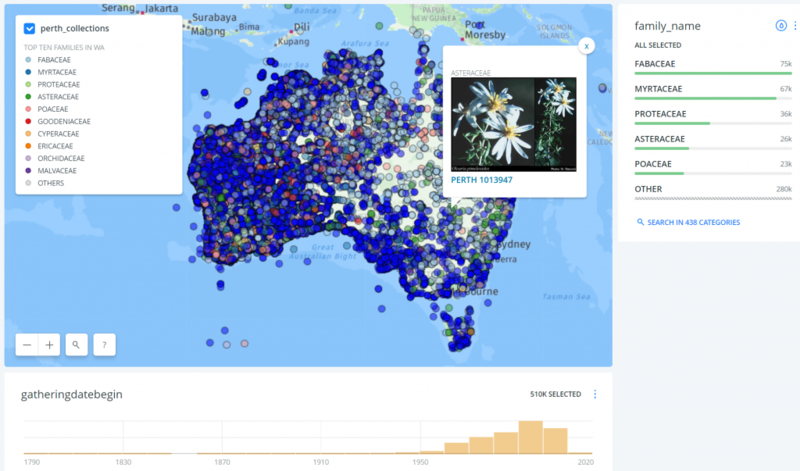 One example of the types of ‘what and where’ that will be asked can be shown in some of my research and development projects that I have been working on over the years, like this example for the Western Australian Herbarium collections, illustrated below. a long-term plan for building infrastructure and connectivity with a strategic plan for increasing and improving the data in the system, and the systems themselves. identification of system dependencies or weaknesses to ensure each contributing information system can continue to reliably deliver. Demand for biodiversity knowledge is increasing. There are many projects aiming to deliver new information — effective and efficient coordination across all stakeholders will be key. If you’d like to talk further about future initiatives, contacted me directly via email (alex.chapman@gaiaresources.com.au), or through Facebook, Twitter or LinkedIn.